The setting was unusual for marital bliss, but it was no deterrent for the dozen-odd couples who tied the knot last week in a mass wedding at a relief camp for riot victims in Muzaffarnagar. Having fled communal violence that recently swept parts of the northern Indian state of Uttar Pradesh and left scores dead and thousands homeless, the newly married couples of Malakpur relief camp held hands together and vowed to make a fresh beginning. Mass weddings are not uncommon in India, where community and religious leaders sometimes host them for poorer communities to help ease their financial burden. 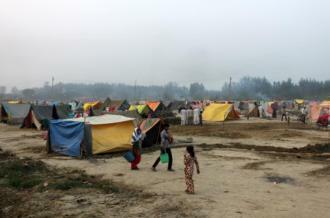 But a spurt of mass weddings at relief camps sheltering thousands displaced by the riots is evoking contrasting emotions. Some hail them as efforts to rebuild lives. Local authorities, however, see them as unnecessary distractions. For the time being though, the riot-hit areas of Muzaffarnagar and Shamli districts in Uttar Pradesh are awash with mass weddings. According to media reports, 27 couples got married in a camp in Shahpur village on September 25. Seventy-two more tied the knot in Jolla village on October 4. On October 7, 155 more marriages took place in Shahpur, while another 32 couples took marriage vows in a village called Budhana. Altogether, more than 300 marriages have now taken place since rioting between Hindus and Muslims in India’s most populous state subsided little more than a month ago. “People don’t have money, especially now, so we want to help them,” said Dr Nadeem Chaudary, 30, a medical professional and member of the Malakpur leadership committee, as he waited for the latest mass wedding to start. 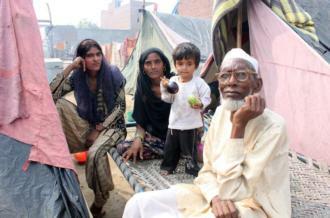 Driven to destitution by the riots and living in fear of fresh violence, residents of the relief camps agree with him. The weddings perhaps give them a semblance of normalcy in abnormal times. Weeks after the riots – Uttar Pradesh’s worst since Hindu activists destroyed a mosque in the city of Ayodhya in 1992 -tensions between communities run high with erstwhile neighbours eyeing each other with suspicion. It also gave the family of Raeshma, 16, an opportunity to hope again. Despite her young age, her parents had arranged for her to marry another boy living in the relief camp. Both families had lost everything in the riots and the mass wedding organised at the relief camp gave them a window of opportunity to make a fresh start. Azgari, Raeshma’s mother, claimed the marriage would help the family considerably. It is not known whether Raeshma had any say in the family decision. But the likes of Azgari say they are not left with many choices in the harsh reality of the relief camps. The 100-member-strong leadership committee of the Malakpur camp also did not seem perturbed by her young age. Though Indian law prohibits child marriages, Muslim Personal Law does not impose any age restrictions for marriages for the community. At the mass wedding ceremony last week, prominent banners proclaiming “Group Marriages for Western UP Victims” were also put up. The sponsor of the ceremony was the Jamait Ulema-i-Hind. The committee therefore raised Rs 15,000 ($244) for each couple, and bought new clothes and jewelry for the girls and dozens of cookware sets. So at the wedding ceremony, each couple would get a bag containing the mehr, or groom’s gift tothe bride, and another bag containing the jahayz, or household items for the new couple – as well as a cheque to help them settle in a new home, outside the camp. Maulana Mahmood Mandni, the general secretary of the Jamait Ulema-i-Hind, flagged off the ceremony. “We feel that if we organise this [weddings], it will be a gift for them, and good for them,” he said. “They can get a homely feeling”. Authorities in Uttar Pradesh, however, viewed the weddings as a distraction from its three-month target of clearing up the camps. “We never supported these marriages and told them they should encourage them only after they returned to their village,” Raj Sharma, the district magistrate of Muzaffarnagar, told Al Jazeera. But mass marriages continue nevertheless. The state government has announced a rehabilitation package for Rs 500,000 ($8146) for victim’s families. It also plans to send them back to their respective villages soon, though activists say it would take much longer than planned. In the meantime, 68-year-old Shah Shamsad of the Shahpur relief camp is planning to marry off his 18-year-old daughter Naima when the next mass wedding take place and send her away. “Because of the violence that happened, what if it happens again, to her?” he asks. Nuptials, it seems, is increasingly being seen by riot victims in relief camps as a road to redemption. This piece was originally published on November 1, 2013, on Al Jazeera English.